We met up earlier today with Tom and Craig, better known at WeLikeStatic to have a sneak peak at their solo show opening tomorrow at Whisper Fine Art on Eastcastle street, London. The place was buzzing with still “loads to do” but the team was at it and the display was shaping up nicely; this show, I could tell, will be a good one. Portraiture is what this show will try to tackle and we all know that it is rather an hazardous path to take, it does not take long to get it wrong and bore your audience with lifeless portraits, emotionless figures. WeLikeStatic has managed with this new set of works to actually put the actual character depictation at a second plan and rather draw your attention to the making process of their pieces of art, this is for sure what got me interested here anyway. “Look at it straight on and it will appear as one dimension work, but do two steps to left (or to the right) and a multi-layered artwork fades in front of your eyes”, giving a complete and unique take to the viewer’s eyes. 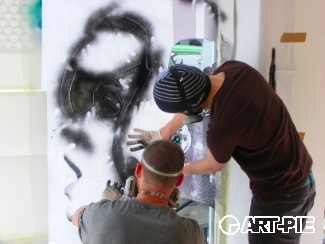 Spray paint, acrylic, screen printing, stenciling on layers of glass, Perspex and aluminum, you name it. A rather inpressive bunch of techniques and mediums got into that show which has been in preparation for months, we were told. And the result is something quite unique or in line with a trend I first had contact with when I encountered Adam Neate’s shows at the Elms Letters Painting Rooms: three dimensional art made of 21st century material – Perspex. 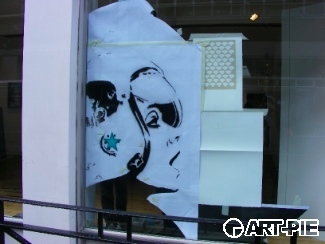 We also got a glimpse of the making of the front window display – the now recognizable space woman face. So far it looked like it will be ace. I cannot wait to see the end result tomorrow.